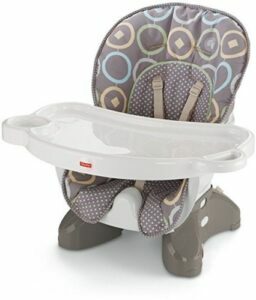 A baby booster seat can be a great mealtime alternative to a high chair. They are ideal for those with limited space around the table, and are also perfect for traveling with. There are so many different types of booster seats for at the table, including some which can be folder, or converted into different modes. Here, you are sure to find the perfect booster for you and your child’s needs. 1 Do you really need a booster seat? 2 When is the right time for buying a booster seat? Do you really need a booster seat? Most parents will find they do require either a high chair or a booster seat once their infant begins to eat solids. It’s certainly possible to get by without one, but by finding the right booster seat for your needs, mealtimes will become a lot easier and less messy. Boosters are designed to ensure your infant is sitting properly for eating, meaning there is less chance of them choking if they are not sitting up straight enough. They are also made from easily cleaned materials, usually plastic. This makes tidying up after a meal much easier and quicker – many parents are surprised to discover how much of a mess a young baby can make with their first meals! Some parents may feel they don’t need a booster seat for mealtimes if they already have a high chair. However, they are really useful for going out and about – if you visit a restaurant where they don’t have baby chairs, or for visiting friends and family. Certain boosters are compact and designed for traveling, which makes them great for visiting family or even going on vacation. The advantage of a booster is that you’ll always have a safe place to leave baby to sit. Babies need a lot of ‘stuff’ so having one piece of kit which can serve many purposes is really useful when traveling. Some boosters have a tray so kids can play as well as eat, and some have storage pockets for keeping diapers and wipes. When is the right time for buying a booster seat? In general, booster seats are designed for using at mealtimes. This means you’ll probably want to wait until your little one is starting to wean before getting them a booster. Some high chairs can be used by younger babies, as they recline and offer a lot of support. However, a booster is usually best for infants who can already sit up unaided. Therefore, most are ideal for children around 6 months old, or who can sit well without support. We have chosen a variety of styles and brands to ensure plenty of variety. We’ve also looked for those with large numbers of great reviews, and have quoted what other parents are saying about the seats to help you make the best choice. We have looked at various aspects such as ease of cleaning and converting, and of course safety and durability. 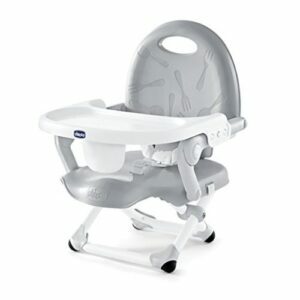 This Fisher Price booster can be easily, securely attached to most dining chairs. The tray can be put in the dishwasher after a meal, and the chair is made from smooth molded plastic. This means crumbs won’t get trapped, and the whole thing is really easy to keep clean. This seat is also ideal for taking out and about. The seat back can be folded down and there’s a shoulder strap for easy carrying. The table booster seat has a lid to cover the tray, keeping it clean between meals. There’s also a cup holder built into the tray, minimizing the risk of spillages. The tray can be pulled out or pushed in – perfect for chunky babies! The back of the seat can be removed for older toddlers who no longer need the extra support, but still need a bit more height at the table. The Fisher Price baby seat is practical for both parents and babies. The adjustable features are great for growing kids, and it can last for years. Parents will love how easily the chair can be cleaned, as well as how simple it is to set up at any table. The booster is ideal for busy families who often eat out or visit friends and family. It’s great for those looking for something long lasting – it gives great value for money. The tray can be a little tricky to take on and off, especially if you want to do it one-handed. Parents say this portable high chair is ‘easy to clean’ and ‘fits perfectly on a bar stool’. Many have said it’s ideal for when the grandchildren come to visit, noting how ‘convenient it is to feed the grandchildren’. One parent said it is a ‘great alternative to a bulky high chair and fits onto nearly any chair’. This space saving baby chair offers all of the features you would expect on a full size version, but at a fraction of the size. It’s perfect for those who don’t have much space around the dinner table. The chair can be used right from birth, as it reclines back and has a 5 point safety harness. The harness can be converted to a 3 point for older kids who don’t need as much support. The Fisher Price Space Saver can be easily stored when not in use, and it’s easy to take on the go too. The tray can be removed and put in the dishwasher, and the seat back can also be removed for toddlers who no longer need the support. There’s a ‘FastFinder’ link, which can be used for hanging bibs and cloths – meaning everything can be kept close during a meal. This baby dinner chair is perfect for those looking for all the features of a traditional chair, but who have little space. It grows with kids from the birth right until they weigh 50 pounds, meaning it’s the only chair your kid will need until they’re around 4 or 5 years old. The seat fabric is spill and stain resistant, and it can be surface or machine washed. This is great for keeping things clean and hygienic at mealtimes. You can even choose a replacement seat pad so you’ll one to use whilst the other is in the wash, and these come in a range of colors to match your decor! The seat is perfect for any household with limited floor space. The portable high chair is said to be ‘very easy to assemble’ as well as ‘easy to clean’. Many parents say it is ‘such a great alternative – it does the same job as a bulky high chair would’. Many parents feel the chair is ideal for taking out or for traveling – it is ‘portable and compact’. This easy to use portable booster can be set up in a matter of seconds. It’s lightweight and folds down to a very compact size. This makes it the ideal choice for those who travel frequently, or who just want to save space at home. The portable booster can be used outdoors, making it great for trips to the park or the beach. There is a 3 point safety harness, and a detachable tray which is dishwasher safe. The chair comes in a choice of either green or pink – perfect for boys or girls. This booster is budget-friendly, lightweight and very compact and portable. It is great for those who really want to save space, or plan on using it out and about often. The fact it can be used outdoors is also really useful for those who love to have lunch in the park. The toddler booster seat has a handy storage pocket on the back of the seat, perfect for keeping mealtime essentials close to hand. It also comes with it’s own handy storage bag which is very practical for those who are often out and about. This booster is excellent value, although it doesn’t have all the features of a more expensive model. It offers little adjustment, meaning it may not last as long as expected. The tray isn’t as large as on some other models, either. The Summer Infant booster has loads of great reviews on Amazon. 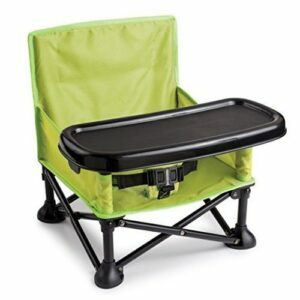 Parents say it is ‘great for camping’ and that their child ‘loves sitting in it’. They also say the chair ‘can be strapped to basically any dining chair or used on the ground’. Parents also say their kids like to sit in the chairs without the trays, just as their own little seat! This portable baby booster is great for taking out and about as it folds completely flat. It can be converted for toddlers – the tray can be removed or folded under the seat allowing older kids to sit at the ‘big’ table. The booster fits really well at a kitchen table when the tray is not in use, making it really easy for kids to sit at the table with everyone else. 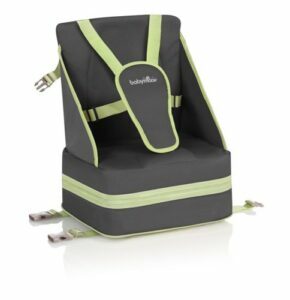 The folding baby booster can be easily carried with one hand using the handle when folded. The seat is attractive and blends in nicely unlike many baby items which can be bulky and unsightly. The seat has two simple straps to attach it to the chair, as well as a 3 point harness to keep kids safely in their seat. We love this booster because it is really compact and portable. It is lightweight and easy to fold, making it perfect for those who are always on the go. It is simple to use, without too many fancy or complicated features. It’s ideal for families who don’t want to spend too much, and want something sleek and simple. This booster is great value for money. However, it can’t be used by very young babies who aren’t already able to support themselves well unaided, as the chair doesn’t offer much support. The tray isn’t adjustable, apart from being removable, meaning it can be awkward to get kids in and out of the seat, especially as they grow. There are also a few more areas where food and debris can become trapped, making it more difficult to clean than some other models. Overall, this folding toddler booster has a lot of great reviews. Parents say it ‘fits well under a table and doesn’t take a lot of room when transporting’. Moms also love how ‘easy to set up’ the Summer Infant booster is. 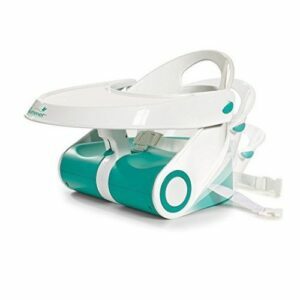 This convertible baby positioner and booster is great for those who want to get the most for their money. It offers 3 different modes, perfect for all situations, and ideal for growing babies. For younger babies, there is a soft foam seat which offers loads of support – similar to a Bumbo seat. There’s also the activity seat mode, pictured here. 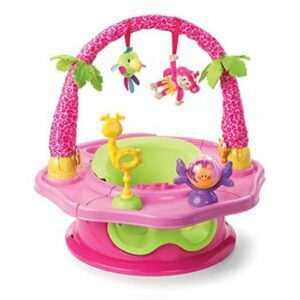 This offers 6 fun toys for baby to look at and touch, and the overhead bar can be removed if desired. For older kids, the booster can be strapped onto a dinner chair and used to help kids reach the table at mealtimes. We love how this seat can convert between different modes as babies grow. It will last for several years, and will save the need for having lots of different baby seats. The seat offers all the features of a high chair, booster and activity chair all in one great product. 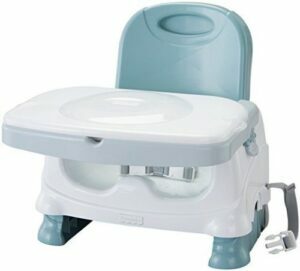 This chair is ideal for babies who have chubby legs – there is plenty room for them to fit under the tray! Some parents feel the tray is a bit difficult to remove, making getting baby in and out of the seat tricky. Babies might quickly outgrow the toy bar – their head might touch the top of it when they get a bit taller. Parents love how early babies can start to use this seat. One mom says how she loves the chair, and her 5 month old can safely play in it. It’s also great for helping younger babies learn to reach for things, improving hand-eye coordination. 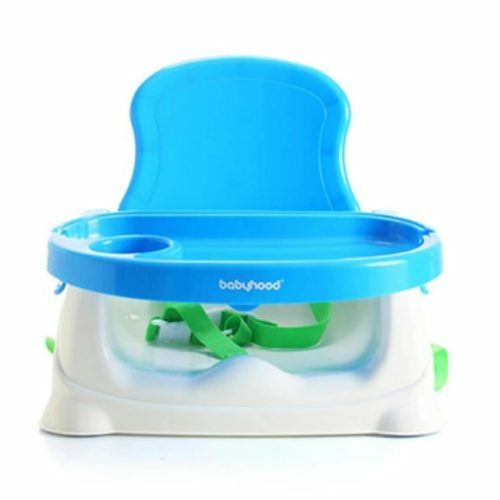 This compact toddler booster seat is great for a quick meal. It is fast and easy to set up, and folds down to a nice compact size when not in use. There is also a carry strap, making it great for taking out and about. The chair is folded using a simple push button, only taking seconds. 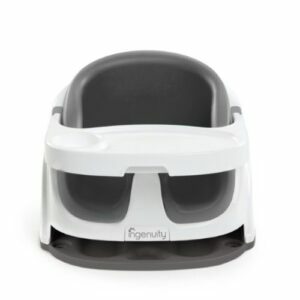 The tray can be adjusted to 3 different positions, making it perfect for chunky babies! There are two straps to hold the booster onto just about any standard chair, as well as rubberized feet to prevent slipping. This chair offers many of the same features as a traditional, bulky baby chair but at a fraction of the size and weight. We also love how easy it is to fold, and how compact it is once folded. It is great for growing babies, and can be used well into toddler-hood – it is the only dining chair your baby will ever need. The chair comes with white straps for the safety harness, which can be difficult for cleaning after a messy mealtime. It also might not fit under the table due to the arms of the chair, although this depends what height setting is being used. Moms and dads love how the chair is ‘safe and reliable when far from home’. One parent says ‘it’s light enough to carry around but solid for baby to sit in’. One mom loves how easy the chair is to take out and about, meaning kids don’t have to sit on dirty high chairs in restaurants, she says ‘I love this chair, I take it to every restaurant and even people’s houses’. This is one of the best boosters for taking out and about. It is easy to fold, and very compact – it folds into its own carry case, with a handle for easy carrying. The seat is made from comfortable and easy to clean neoprene, rather than hard plastic like many other models. The booster offers two height adjustments, making it ideal for babies or older toddlers. This baby booster seat is one of the best for portability. It folds down easy and to a really compact size, and is light and easy to carry. The Babymoov booster is the perfect choice for parents who often go out to eat, and don’t want to have too much extra gear to carry. The booster is ideal for using out and about but is quite basic, so not ideal for everyday use at home. There isn’t a tray, meaning it can only really be used at a dinner table. The chair doesn’t offer as much support as some other models, so it’s best suited to babies who can already sit well without support. Parents love how the portable high chair can be adjusted to different heights, and how easy this is to do. One mom also loves how easy the chair is to clean – the chair is wipeable but the cover can be removed from the frame and put in the washing machine for a thorough clean. This simple yet practical baby booster chair comes in a choice of 5 bold colors. The chair is perfect for keeping in the trunk – it doesn’t take up much space and means baby can dine with you in restaurants even when they don’t have high chairs. The booster has a removable tray, which can be stored underneath the seat to ensure it won’t get lost or left behind. The inside part of the seat can be removed when baby grows, meaning there is plenty space for older toddlers to sit comfortably. The baby and toddler booster seat is simple to use, and is sleek and stylish. It will look great in any home, and the color choice means there’s something to match any color scheme. The chair is simple yet has a range of handy features, for both parents and babies, and offers great value for money. The tray on this booster is not adjustable, meaning there is little flexibility for growing children. It is also quite small, meaning some plates will not fit on. The chair also doesn’t have any height adjustments, which can be a problem when used at different tables, or as baby grows. This chair has loads of great reviews from parents. One dad loves how it can be used by multiple children ‘from 4 months to 4 years old’. He also says ‘the tray is secure when attached, and the base of the chair is secure’ – this is a great, safe chair. One grandma says it’s great for young babies – ‘it’s sturdy and helps support my grandson who’s still not perfectly steady sitting up’. Choosing the perfect booster chair for your baby’s mealtimes is mostly down to individual preference. It’s best to think about if you are looking for something which can be easily taken out and about, or something with most of the features of a traditional high chair for using at home. Also check how long the chair can be used for, to ensure it will provide as much use as you’ll require.